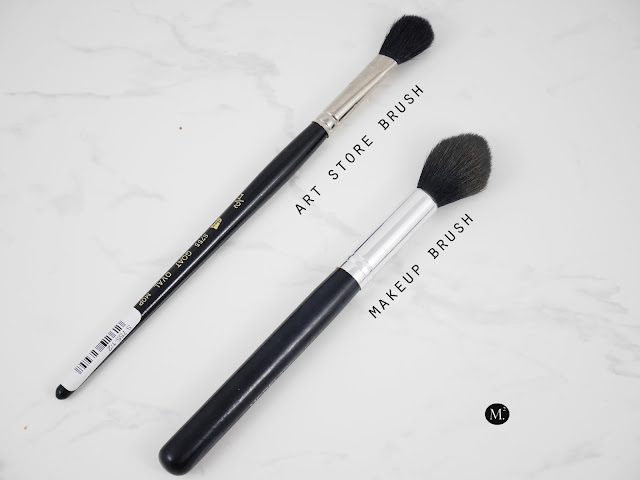 MEET MARIEE: BEAUTY GRAB | Art Store Brushes for Makeup?! BEAUTY GRAB | Art Store Brushes for Makeup?! 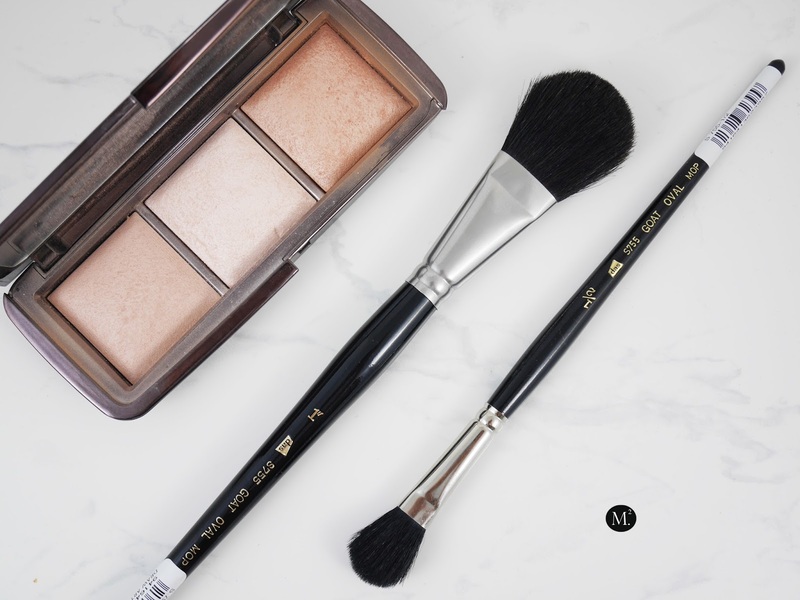 When it comes to a flawless makeup application, makeup brushes are must haves! It makes everything apply seamless and flawless! Makeup brushes are definitely something I like to collect especially when they're soft and fluffy! I had thought of trying on art store brushes to see if it will work great with makeup as much as it works with paint! There are different types of bristles out there, the most popular one is synthetic as it is the easiest to clean and maintain! Well, thats the case with makeup brushes which I prefer the most! However, when it comes to art store brushes synthetic aren't the best if you are thinking of using it with makeup! Most art store brushes' bristles are very stiff with very long bristles which is not very ideal especially with makeup application. There are a few art store brushes with real hair such as goat hair, squirrel hair, sable, squirrel, etc. I won't go in depth but you know what I mean. For me, the best one I find that picks up makeup powders is the goat hair! It's so soft, fluffy enough to blend the product into the face, and picks up reasonable amount of product! 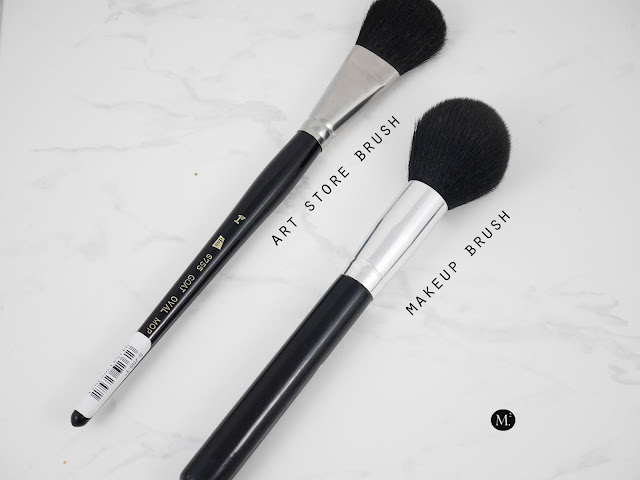 The prices of art store brushes can vary and it can get quite pricey but there are definitely tons that are quite affordable! The only downside of art store brushes are the handles! But the ferule and bristles are exactly the same as makeup brushes! The two that I purchased were called Goat Oval Mop brushes 1" and 1/2". Both are really really soft! The bristles are quite flat and tapers up which is great for a concentrated application. 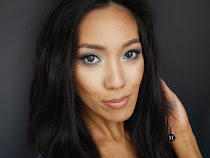 I tried the 1" to apply bronzer and it helped the bronzer glide smoothly and evenly. 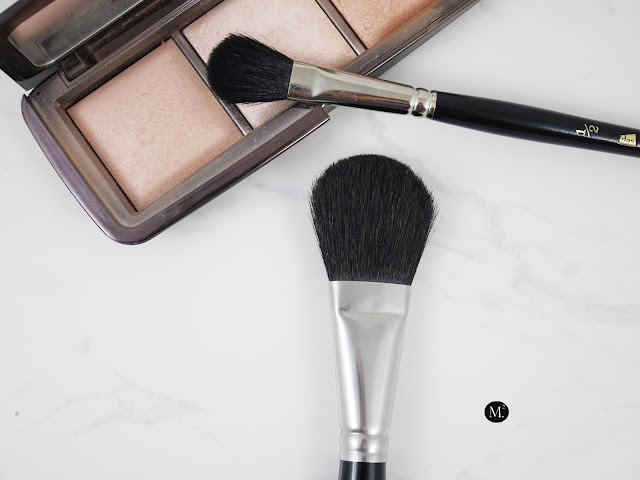 Another use for this brush would be for applying powder or blush. In comparison to my usual powder/bronzer powder (refer to photo below), you can see right off the bat the handle and height differences. In this case, I actually like the art store brushes' tapered handle more as it lays flat on top of the table and does not roll over as supposed to the round handle from makeup brush. To apply my highlight, I use the smaller brush 1/2" and it did what I expect it to do. Again, highlighter application is on point! Since, the brushes are made of natural hairs cleaning it can get high maintenance. Regular baby shampoo or dish soap would do the trick but then the longevity of the bristles won't last as long. Like our own natural hair, it needs condition for it to last and stay fluffy! So adding olive oil whilst washing would really help the bristles or even a conditioner! I'm loving these brushes as of late and I'm on the hunt for perfect eye brushes from the art store and will report back to you! If you don't have any access to buy makeup brushes you like, I suggest hit up your local art store! 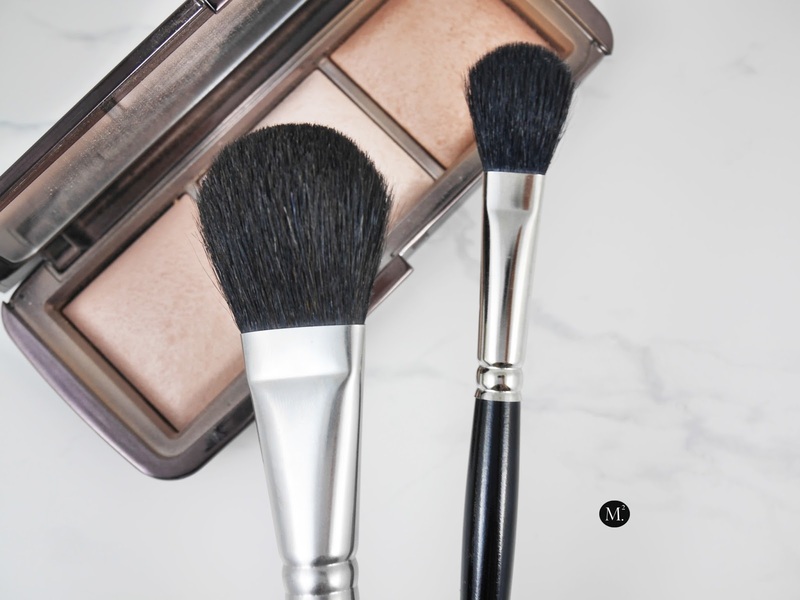 You might find your holy grail brushes that will work for you!